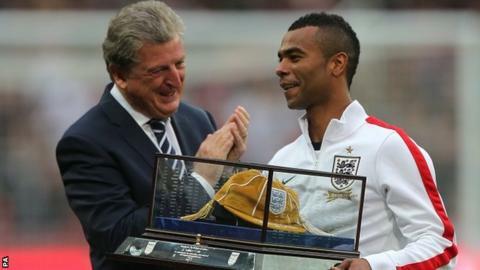 England boss Roy Hodgson says there is an element of risk in his decision to overlook Ashley Cole for Southampton's Luke Shaw in his World Cup squad. Chelsea's Cole, 33, announced his international retirement when Hodgson decided to take 18-year-old Shaw to Brazil. "Circumstances could make the decision a very good one or could make it a very bad one," said Hodgson. Everton's Leighton Baines, 29, will be England's first-choice left-back. The England boss insisted Cole, who has won 107 caps, was not a cover player and added he did not have the "luxury" of selecting three left-backs in a 23-man squad for the tournament in Brazil. "Do you really think a player of Ashley Cole's ability, with 107 caps, should be invited along to a tournament on the basis that he might get the odd game because all he is there for is to cover the left-back who has taken his spot?" asked Hodgson. "Is that the correct thing to do with a player like him? "Time will tell whether the decision was a good one or a bad one, because circumstances move." However, Hodgson did not exclude the possibility of Cole being asked to help in an emergency, although he could only be called up if a tournament-ending injury is suffered by a member of the squad after 2 June. If it happens before, the change must come from within England's seven-man stand-by party. England open their World Cup campaign against Italy on 14 June, before further Group D games against Uruguay (19 June) and Costa Rica (24 June). They warm up for the tournament with matches against Peru at Wembley on 30 May, followed by games against Ecuador and Honduras in Miami. Hodgson said Shaw, who is reported to be the subject of a £27m bid from Manchester United, had enjoyed a superb season with Saints. "He has a fantastic future in front of him and many people might suggest he deserves a chance to be in the England squad," said Hodgson. Shaw is one of a number of young players in the squad - only six of the group have been to a World Cup before - and Hodgson revealed he had been checking up on players to make sure they can behave themselves. "There are some younger players here, but we have worked with them all at one stage or another and we have done our research with the clubs," the England boss said. "I will be disappointed if it turns out one of them is not the traveller we think he can be." Cole became only the seventh England player to reach a century of caps when he appeared in a friendly win over Brazil in February 2013. But his opportunities at club level have been limited this season. The former Arsenal player made only one substitute appearance in three months from late January for Chelsea. He returned to the side for the final five matches of the season, including key games against Liverpool and Atletico Madrid.